Or how to excavate a binary masterpiece that could otherwise be lost forever! The long believed to be inaccessible for mortals 6500/1 firmware of the VC-1520 device has been retrieved! 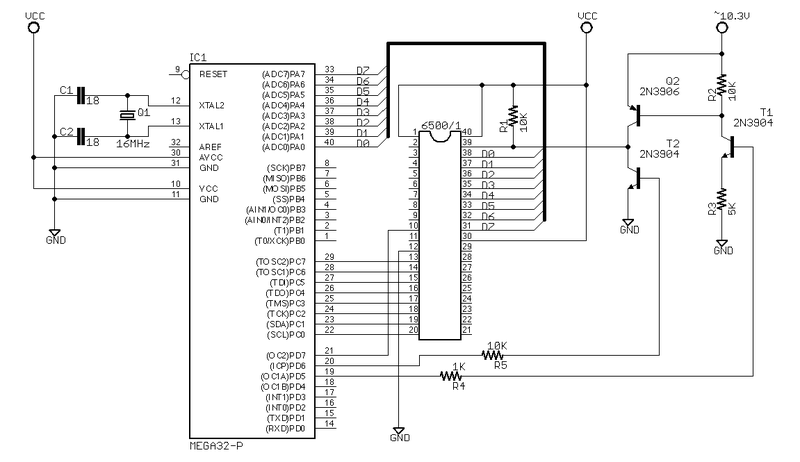 Special test logic provides a method for thoroughly testing the 6500/1. Applying a +10V signal to the RES line places the 6500/1 in the test mode. While in this mode, all memory fetches are made from Port PC. External test equipment can use this feature to test internal CPU logic and I/O. A program can be loaded into RAM allowing the contents of the instruction ROM to be dumped to any port for external verification. All 6500/1 microcomputers are tested by Commodore Semiconductor Group using this feature. in the lower-right corner of the multi-project workbench! He connected everything, wrote the necessary AVR code, run the first test and found out that it... doesn't work!. A few more advices, a few more tries and still no good news. 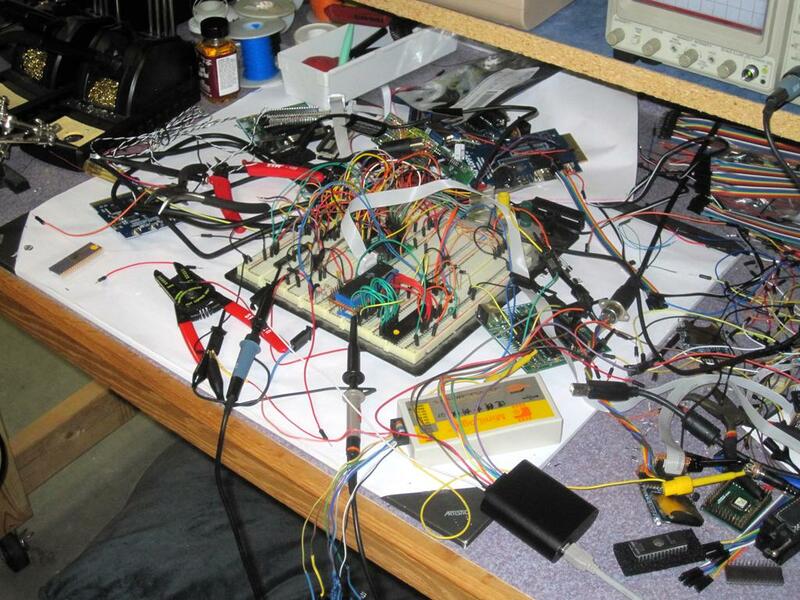 Until late night (or maybe early morning is more appropriate wording here) he realised that the fuse settings on the AVR he used, caused JTAG to be turned on, which in turn caused incorrect opcodes being sent to the 6500/1. After correcting this mistake, on 2014-07-04 at 0816Z correct data started to flow off the Commodore's SOC, probably for the very first time outside of MOS/CSG's production facilities. But this innocent looking string of hexadecimal digits is what many people have been waiting for! Inside the surprisingly few bytes above, some currently unnamed authors implemented a whole control of the printer/plotter's hardware, full serial IEC communication stack, and on top of those they still managed to squeeze a fairly complete font with 96 vector characters in! An example of software engineering craftsmanship at the level we don't see all too often. If your browser supports SVG images, you can peruse the font below in its full, vector-based glory. Makes analysing and preserving the 1520 firmware possible. Allows insightful explanation of all the inner workings of the 1520 device. Enables creating a 100% accurate 1520 emulation e. g. in VICE. Opens clear path to analyse, archive and preserve ROM content of many other devices controlled by variants of the 6500/1 SOC. ◦ Absolutely awesome stuff Jim. ◦ I guess it's exactly for the moments like this we all indulge in this kind of stuff. The process got broken into several stages, each with its own set of problems to be solved. Change the mode of operation into "test mode" - Now a bit more tricky exercise. 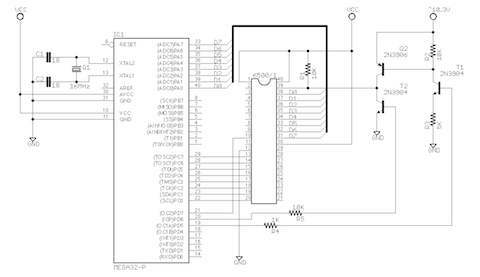 No GPIO will give us a way to select between three different states and their respective voltages. A bit of a circuit had to be devised and connected to the RES line. You can see it on the right-hand side of the diagram above. "[...] a program can be loaded into RAM allowing the contents of the instruction ROM to be dumped to any port [...]"
-- = Byte supplied as operand or "dummy" cycle (when the CPU executes the command). Supply a "downloader" program to the I/O port C and make the CPU execute our externally supplied binary code. Upload the actual "dumper" program this way. Sure it must be possible but Greg King suggested a far easier approach. While more of a hack than "industrial solution", this has proven to dramatically lower the number of potential issues and led directly to the successful end. Instead of three further stages the first supplied program is both a "downloader" and "dumper" in one. Although at a cost of speed and the need to recompile the code for each page to be dumped. The code takes a brute force approach to pulling memory contents from the 6500/1. Based on a plan by Greg King to simply pull data directly from the ROM, with no need to create a program that runs in the 6500/1, the code holds RESET low for a suitable time, puts the CPU into TEST mode, and tries to synchronize the opcode stream using a set of opcodes provided by Gerrit Heitsch, modified based on empirical testing. Once synchronization happens, it instructs the internal CPU to load one memory location into the .A register, dropping out of TEST during the cycle when the load from ROM occurs. 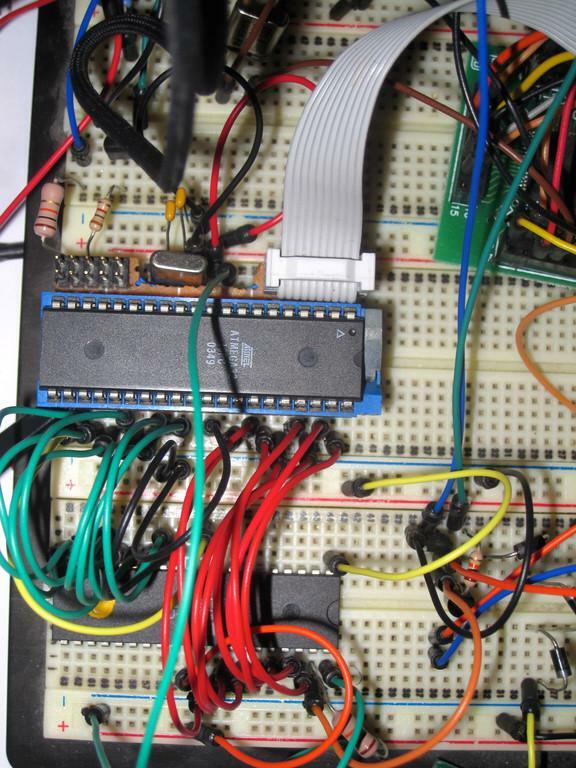 It then stores the data to PORTA, JAMS the CPU, and the AVR reads the data from PORTA, sends it out via the AVR UART, and then repeats the process for the next memory location..
For a long time people believed the 6500/1 SOC ROM content is stoned inside the black plastic for good. There were several threads in various places over the internet but yielded no results. Until first days of July MMXIV..